"In an age when more and more Americans find themselves changing jobs and careers, Mindshift provides indispensable advice and help." "Top 10 books that will change your life in 2017." "5 New Books You Need on Your Reading List"
"The message of Mindshift is utterly convincing—you can learn, change, and grow, often far more than you can imagine. Read, learn, and enjoy!" Francisco Ayala, University of California, Irvine, Former President and Chairman of the Board of the American Association for the Advancement of Science, author most recently of EVOLUTION, EXPLANATION, ETHICS AND AESTHETICS. TOWARDS A PHILOSOPHY OF BIOLOGY. "Brace yourself: This book will change your entire perception of what you thought was possible. Barbara Oakley will make you realize that you can change—and change quite profoundly—by making just a few tweaks to how you learn, and she will show how these methods are becoming increasingly available to everyone. Upgrade your mind, upgrade your life, with this book"
"MINDSHIFT is essential reading for anyone seeking a reboot, reset, or reinvention. As Oakley trots around the globe and across disciplines, she explains the power of taking a “pi” approach to your career, why worriers often get ahead, why negative traits can house hidden advantages, and why it’s smarter to broaden your passion than follow it. Jammed with inspiring stories and practical tips, MINDSHIFT is a book that can change your life." ""Significant change is possible. With those four hopeful words, Barbara Oakley opens the door to an entirely new way of seeing and reaching our potential. Don't hesitate, it matters."" "Open this book to open your mind. 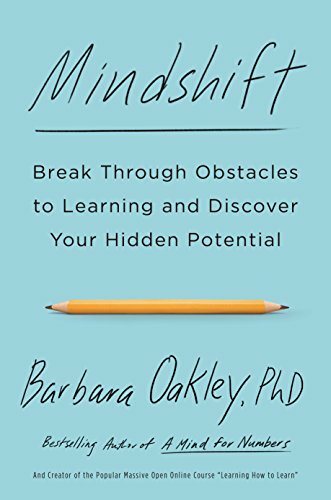 In Mindshift—both a collection of inspiring stories and a field guide to creating change--Barbara Oakley shows how deep learning, deep practice, and deep transformation work and drive progress and possibilities." "MINDSHIFT is a fantastic book about how we learn and how we can use our talents (or learn new ones) in order to create a more satisfying career for ourself. If you're stuck in a rut and don't know what to do next in life, this is a phenomenal resource to help you find your way. Dr. Oakley is a master of storytelling and of sharing ideas that can help inspire you to get out of your comfort zone and LEARN!" "VERDICT: Superb not only for those who are struggling or who are expert at math, but for readers who wish to think and comprehend more efficiently." "An ingeniously accessible introduction to the science of human cognition—along with practical advice on how to think better." "In my book The Math Instinct, I described how we have known since the early 1990s that all ordinary people can do mathematics, and in The Math Gene, I explained why the capacity for mathematical thinking is both a natural consequence of evolution and yet requires effort to unleash it. What I did not do is show how to tap in to that innate ability. Professor Oakley does just that." "Being good at science and mathematics isn’t just something you are; it’s something you become. This users’ guide to the brain unmasks the mystery around achieving success in mathematics and science. I have seen far too many students opt out when they hit a rough patch. 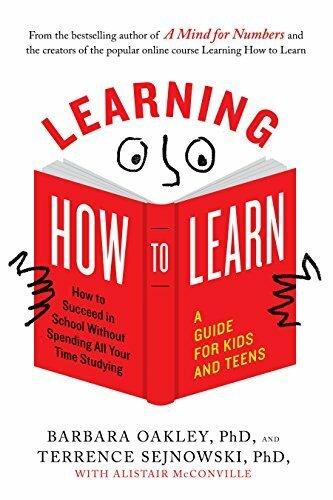 But now that learners have a handy guide for ‘knowing better’ they will also be able to ‘do better.’"
"A Mind for Numbers is an excellent book about how to approach mathematics, science, or any realm where problem solving plays a prominent role." "I have not been this excited about a book in a long time. Giving students deep knowledge on how to learn will lead to higher retention and student success in every field. It is a gift that will last them a lifetime." "A Mind for Numbers helps put students in the driver’s seat—empowering them to learn more deeply and easily. This outstanding book is also a useful resource for instructional leaders. Given the urgent need for America to improve its science and math education so it can stay competitive, A Mind for Numbers is a welcome find." "A Mind for Numbers is a splendid resource for how to approach mathematics learning and in fact learning in any area. Barbara Oakley’s authoritative guide is based on the latest research in the cognitive sciences, and provides a clear, concise, and entertaining roadmap for how to get the most out of learning. This is a must-read for anyone who has struggled with mathematics and anyone interested in enhancing their learning experience." 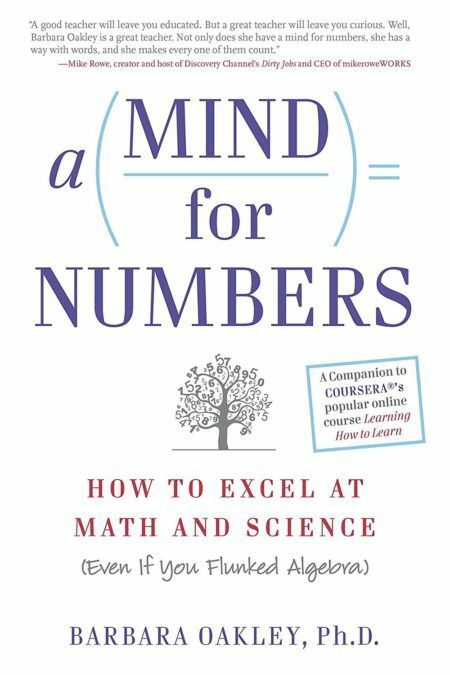 "For students afraid of math and science and for those who love the subjects, this engaging book provides guidance in establishing study habits that take advantage of how the brain works." Deborah Schifter, Principal Research Scientist, Science and Mathematics Programs, Education Development Center, Inc.
"A Mind for Numbers explains the process of learning in a fascinating and utterly memorable way. This book is a classic, not only for learners of all ages, but for teachers of all kinds." "Mahatma Gandhi once said ‘unsustainable lifestyles and unacceptable poverty should become problems of the past, to achieve harmony with nature and with each other.’ Practicing Sustainability not only brings out the relevance of this vision clearly, but also the need to develop better concepts and pathways to achieve that vision." "An enlightening book that demystifies what sustainability really means with a fresh, unusual range of voices and practical insights. Practicing Sustainability should be read by anyone who cares about the future of our planet." "In this unique collection, each reader will find three or four sparks―things that will connect with their head or heart or both, and perhaps spur them to real action. It's a necessary book!" "Practicing Sustainability is an engaging and ultimately uplifting kaleidoscope of ideas from the people on the front lines of building a better planet." 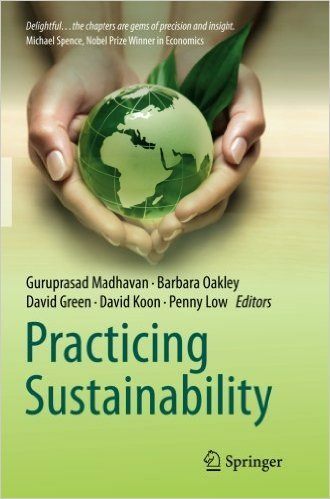 "An important book that contributes greatly to the understanding and practice of sustainability in a comprehensive, lucid, and thoughtful way." "The popularity of 'sustainability' has taken a toll on its meaning―it is too often used as a lofty aspiration or as a vague objective. This book provides a great antidote to this trend. Practicing Sustainability is a must-read for anyone looking for good ideas on how to make sustainability more real and concrete." "t is rare-actually, probably unprecedented-to find in a single volume discussions of the moral right to sell one's kidney, of friends who enable an alcoholic's benders out of a misplaced sense of empathy, of people who hoard animals (the not-at-all apocryphal crazy neighbor who lives with 87 cats), of the psychological motivations of suicide bombers, of the genetics of individualism and collectivism, and of the frequent failings of well-intentioned foreign aid programs. This is that rare, if not unique, volume. It manages the impressive feat of pulling together the best research from psychology, genetics, neuroscience, evolutionary biology, and law on well-meaning but ultimately harmful forms of self-sacrifice. It will forever change the way you look at altruism"
"WOW-what a book! Can one be too nice? In this fascinating volume Barbara Oakley and her collaborators show how altruism can bleed into misplaced, excessive, self-righteous, or self-serving pathologies. Why this occurs and its societal implications make this book essential reading for anyone who truly cares about helping others"
"What is grand about the collection is that light pours in through every contribution, and even the glare of competing views can reveal dark assumptions"
"What most of us perceive as unmitigated evil, its perpetrators sometimes regard as self-sacrifice in the name of some delusional cause. Suicide bombers, terrorists, messianic cult leaders guiding their following to self-destruction usually think of their heinous acts as benefiting humanity at the cost of self-deprecation. So did Adolf Hitler. To understand such behaviors, it is necessary to understand 'pathological altruism' in its many manifestations. This volume is unique in examining 'pathological altruism' from various angles with unfailing insight and depth. The book will be an invaluable source for psychologists, psychiatrists, sociologists, historians, criminologists, as well as fascinating reading for the general educated public." "Be careful what you wish for' might be one way of summing up the take-home message of this strikingly original book, highlighting the fact that 'more is not always better' when it comes to either being the altruist or the recipient of altruism." ""Can there be too much of a good thing? Surely, eating too many chocolate chip cookies will lead to a sore stomach, but too much altruism bringing about harm?! In PATHOLOGICAL ALTRUISM, experts in diverse fields consider the phenomenon of radical altruism, from battered women to suicide martyrs, and from autistic people to foreign aid givers, and all the way to Mahatma Gandhi. Is pathological altruism a disease, an addiction, an evolutionary relic, or perhaps a mirage? This is a wonderfully engaging and thought provoking book: you may not agree with all of its arguments, but you'll never look at kindness quite the same way again." "Pathological altruism? Sounds like an oxymoron, but this fascinating book quickly convinces you that altruism can go seriously mad and bad. The great breadth and quality of contributors to this book from psychiatry, psychology, and philosophy - and that's just the 'P's' - shed light on the dark side of our evolutionary propensity towards altruism, which can be subverted to a wide range of pathologies such as survivor guilt, drug co-dependency, personality disorders, and eating disorders. When within-group altruism is exploited to between-group hostility, it can lead to suicide martyrdom and genocide." "Read this book. You will learn much that would be new to you, whatever your expertise or interest. And I would be surprised if you don't enjoy this voyage of discovery." "It will lead the way for future investigators and scientists to open the doors of inquiry into a new and most interesting field of inquiry. 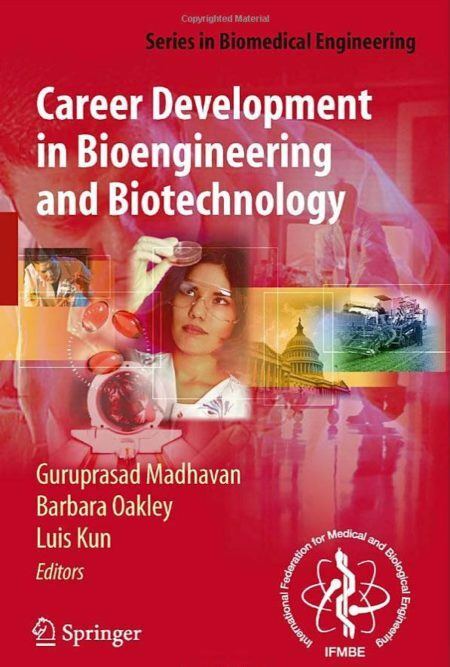 It is well done, reader friendly, and highly praised by leaders in the scientific and educational communities. I will add my praise to those and recommend it highly." 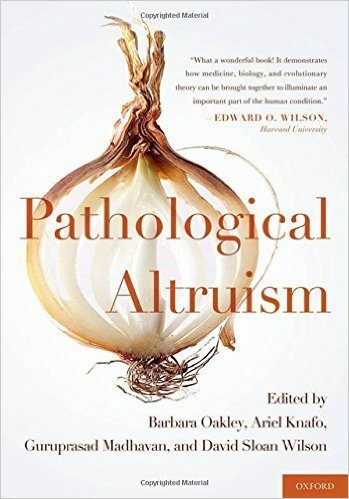 "Overall, this is a well-written, easily comprehensible collection of typological (epidemiological) investigations into "altruism's gloomy underbelly" (p. 7)asserting that "some people are pathological altruists in their essence" (Krueger, p. 298). From its seemingly oxymoronic title to the final chapter, the content flows logically in a coherent, clear, and convincing presentation of all aspects of altruism. Ultimately, the book adds to the growing scientific examination of empathy and prosocial behavior. It is a must read for clinicians and researchers interested in these fields." "Apparently not, at least for a lot of people. One of the best pieces in Pathological Altruism is David Brin's chapter on addiction to indignation: "Self-addiction and Self-righteousness." You might see why looking to feel outraged as often as you can is pathological, but how could overweening, self-righteous huffiness ever be described as altruistic?" "By showing the mix of good intentions with themes such as hording, self-righteousness, and addictions that are taken to extremes, authors provide readers with a strong understanding of how people alleviate their own personal distress by trying to help others. Specific chapters offer varied insights into how altruism affects self-care, relationships, and civic engagement. Taken as a whole, the book helps readers better imagine how they might participate in civil discourse." "Cold-Blooded Kindness is a terrific book. It combines old-fashioned narrative skills with new insights from science and a tough-minded view of good and evil that is neither sentimental nor cynical." "Cold-Blooded Kindness is a masterpiece. Our culture mistakenly teaches that all acts of kindness and altruism are good, but there are many overlooked victims out there who know that kindness can also control, manipulate, and harm. This book is their salvation." "Truly a tour de force. Barbara Oakley couples the story-telling gifts of a born novelist with the insights of a sophisticated neuroscientist. Beginning with a sensational crime, Cold-Blooded Kindness gradually pulls back to reveal labyrinthine depths of duplicity conducted on a grand public scale. I alternated between shivering in horror and laughing out loud. This book is a murder mystery, a case study in social pathology, an artist's biography, a courtroom drama, and a scientific detective story all at once. A lot is at stake: human decency; the integrity of the legal system; and the powers of science to illuminate human behavior in its strangest and darkest forms. Cold-Blooded Kindness is a triumphant achievement." "Barbara Oakley has written the most ambitious kind of true crime book, one that goes beyond a story well told and takes the lid off the simmering conditions and psychopathology that cook up into a tragic killing. There are haunting warnings for all of us in Cold-Blooded Kindness, as well as a fundamental truth: Homicide is self-will run riot—even if it wears a smiley face." "This brave and important book reminds us that even our best intentioned assumptions become prejudices if they go too long unexamined. Truth and justice deserve our rigorously honest attention and we must trust that they will protect us better, in the long run, than convenient lies. The book is also an excellent read—lively, suspenseful, strange, and as insightful as it is disturbing. You should read it." "Cold-Blooded Kindness is a masterful fusion of analytic depth and powerful narrative. A singularly incisive expose of the fallacy of simplistic moral dichotomies we routinely deploy to judge (and misjudge) the intricacies of human nature. And a gripping read to boot." "Barbara Oakley sets her sights on a seemingly mundane act of domestic violence to reveal the many hidden layers beneath. To make sense of those layers, Oakley uniquely dissects the dynamic psychological, social, and cultural forces that led an artistically gifted and seemingly kind and caring woman to kill her husband. Was she an abused victim or conniving victimizer? 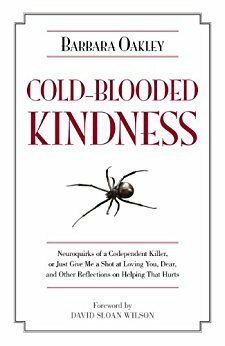 Read Cold-Blooded Kindness and find out." "A wonderful, intelligent and engaging study that illuminates the disturbing relationship between some of those who appeal to our better instincts, as victims, and those on whom they prey, including ourselves—it will grip the general reader and should be compulsory reading for anyone working in the 'caring' professions. For many the world will never look the same after reading this book"
"...this is truly an outstanding book that is the first of its kind...certainly a pioneering contribution." "This excellent volume is without comparison and deserves a place in every biology, medical, engineering, and undergraduate library"
"A highly readable, entertaining, groundbreaking, must-read study with notable insights on the rise and fall of empires; but more importantly, it offers, perhaps for the first time, a distinctly plausible mechanism for explaining the origin and persistence of social inequality.”"
"As a forensic psychologist who has spent much of my career delving into the darkest recesses of the criminal mind, I have often wondered what roles genes and environment play in subsequent psychopathic behavior. Barbara Oakley’s outstanding Evil Genes provides the answer." "This book conveys an enormous amount of complex, up-to-date scientific information in an extremely ‘digestible’ manner. Dr. Oakley manages to illustrate how, although our genetic makeup is not our destiny, there are clearly people who have an unfortunate dose of risk genes. These people often have impoverished social and emotional experience and can cause suffering to those around them. Although firmly grounded in science, this book is also compassionate and forces the reader to examine their own beliefs and prejudices inthe light of what is currently known about the nature and nurture of ‘evil.’"
"Blending brisk studies of notorious evildoers with her own difficult family history, Dr. Oakley skillfully weaves together a panoramic mix of history, psychology, and the complications of human behavior to make a stimulating, provocative, and accessible read.”"
"Oakley has dealt Hitler, Stalin, and all of their kind—past, present, and future—a telling blow with her perceptive exposition of their psychopathy. A courageous, groundbreaking exploration not only of evil in the modern world, but of her family’s darkest secrets." 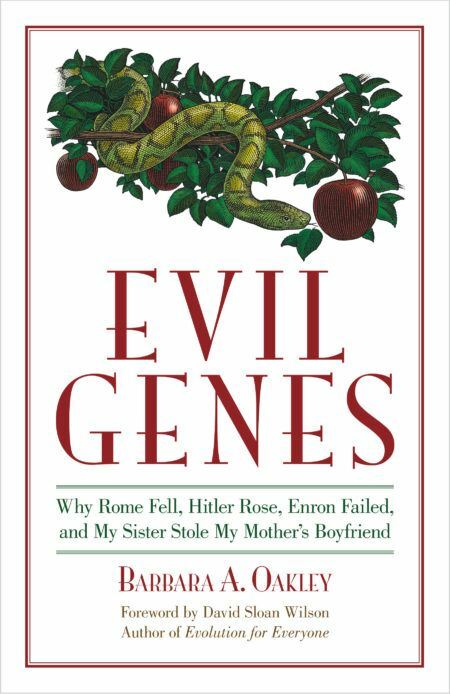 "Through a fascinating blend of state-of-the-art science, political biography, and personal catharsis, Evil Genes constructs a provocative blueprint for our understanding of the ‘successfully sinister’ among us." "Many of us encounter people whose reactions are puzzling. They are easily hurt and offended. Even when someone is being generous, or kind to them they might react with anger, revengefulness, defensiveness, suspiciousness, or aloofness. These are difficult people to have as friends, relatives, colleagues, and even as patients. Dr. Oakley has written a comprehensive and compassionate explanation for why some people are like this that will be fascinating to anyone who has encountered this type of person and cared enough to wonder ‘why?" "A magnificent tour through the sociology, psychology, and biology of evil. No one should pass up the experience of stepping through the portals of this fascinating book to answer Oakley’s crucial question: Why are there evil people, and why are they sometimes so successful?"